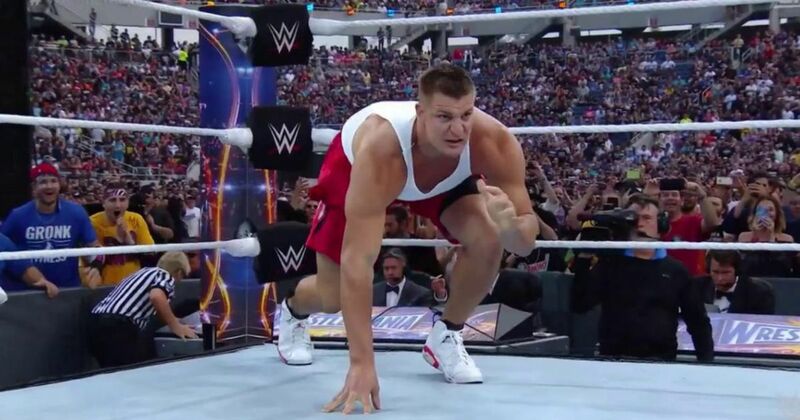 So…is Rob Gronkowski joining WWE? – AiPT! So...is Rob Gronkowski joining WWE? So…is Rob Gronkowski joining WWE? The man didn’t enjoy himself on the most successful team in NFL history last season. Will his acting aspirations draw him to the world of WWE? Rob Gronkowski is possibly the most effective tight end in all of the NFL, and arguably one of the best to ever play the position. He’s been a pivotal part of the legendary New England Patriots dynasty, winning two Super Bowls with the team. He’s also undeniably a goofball, someone who loves to have fun and doesn’t quite seem to fit in the rigid all-business framework of Bill Belichick’s Patriots. This unique mixture of athleticism and showmanship has led to natural speculation that Gronk would eventually join WWE, where a man like him could thrive with proper training. WWE Superstar and former football player Mojo Rawley is one of Gronk’s buddies, and Gronk has been spotted at multiple WWE events supporting him, most notably at WrestleMania 33, where he hopped the barricade and got physical with future WWE Champion, Jinder Mahal. For a long time, that’s where the speculation ended. Yes, he has friends in WWE and seems to at least have a casual respect for the pseudosport. But he’s one of the best players on the best team in modern football history, racking up record after record on his way to multiple rings. He’s only 28; why would he stop now? And if he did, why would he take the huge pay cut it would require to jump ship from NFL megastar to WWE Superstar? Recently, however, the speculation has become a bit more substantive. Reports have come out saying Gronkowski "didn’t enjoy himself" last season. The grinding nature of the robotic Belichick culture combined with the abnormally large number of injuries the big man has sustained in his career — including a concussion right before Super Bowl 52 — makes retirement seem a bit more possible. He’s also stayed silent on his plans for next season, refusing to commit to it or rule out retirement. What would Gronk do if he wasn’t playing football? Sources say he’d like to pursue an acting career. And for an athlete looking to turn into an actor, WWE seems like a natural place to start, especially since he has an in. Hey, it worked for Dwayne "The Rock" Johnson, John Cena, and Batista. The rumors have become so pervasive that Mike Johnson of PWInsider was on Boston’s AM sports talk radio show, Toucher and Rich, to talk about the potential jump. Just found out @MikePWInsider is going to be on @Toucherandrich. This amount of wrestling on The Sports Hub lately is surreal. Indeed, Boston’s premier sports talk station has had an unusual amount of rasslin’ talk lately thanks to Gronk. Sure, 98.5 The Sports Hub actually has a number of WWE fans on staff, but most of the wrestling segments are reserved for wrestlers doing media rounds before a Boston-area show, or making fun of James Stewart. "Will he stay or will he go" hysteria in New England has reached a fever pitch, amidst many other rumors implying the implosion of the New England Patriots dynasty. As a lifelong Bostonian — therefore lifelong New England Patriots fan — and a lifelong WWE fan, this has me all kinds of conflicted. I would no question rather the Patriots clear the air, get everyone on the same page, and keep the band together long enough to try to make it to a few more Super Bowls before Brady’s cyborg body runs out of batteries. But it’s hard to deny the allure of someone so well known who seems like such a natural fit for the squared circle. As for what he’d do if he did join? Well, obviously, WrestleMania is coming up. Gronk helped his buddy Mojo Rawley win the Andre the Giant Battle Royal last year, mowing through Jinder Mahal in the process. The Modern Day Maharaja currently has no plans for Mania — a showdown with Gronk would be a high-profile way to get the former WWE Champion on the card. Either way, it seems that Smackdown Live would be a natural fit, as both Mojo and Jinder are on the brand, and Gronk wouldn’t be overshadowed by the other legit athlete-turned-sports-entertainer over on Monday nights, Ronda Rousey. It’s going to be an interesting — and possibly heartbreaking — offseason for Patriots fans. But if I lose Gronk in one of my worlds so he can excel in another, it may be a little less difficult to swallow. And hey, “Gronk Spike” is a pretty sweet name for a finishing move.